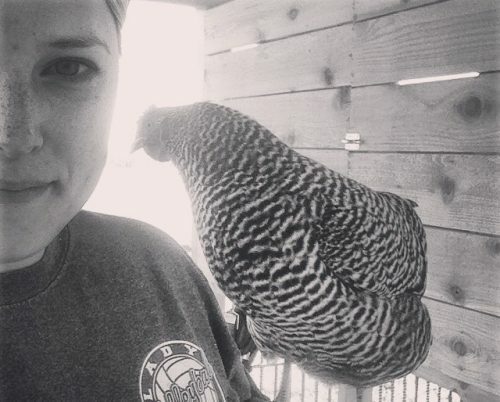 Blog Home | Chicken Behavior | My Chicken Ate My Earring! In a panic, I looked around and even started crying, scaring my six-year-old into crying along with me. We both began sifting through piles of gravel and sand looking for my tiny stud. We must have been a sight! But in the end, we came up empty handed. Clearly Big Mama the chicken ate my earring, right? That must be what happened. I wanted to catch it when it came out the other end, so I isolated her in my chicken infirmary, a modified dog crate. 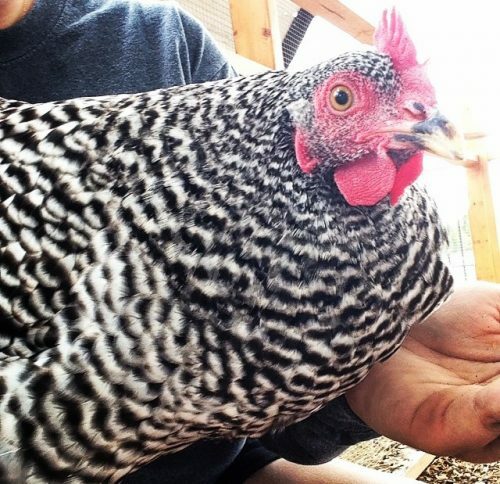 But after a while, I began to worry that she would keep the earring in her digestive tract since chickens will normally consume rocks and grit to aid in digestion. Faced with this concern, I called our local vet (who happens to be my uncle) and persuaded him to let me bring my chicken in to be X-rayed. His practice doesn’t normally take chickens, but luckily, for me he made an exception. With Big Mama loaded up in the car with us, we headed to town. I sat in tears in the waiting room while Big Mama was taken back. In a while, they brought her back to me along with the X-ray; no earring. My Uncle did say that she was the nicest chicken he had ever seen, but I wasn’t in the mood to accept a compliment on her behalf. But if my chicken didn’t swallow the earring, then where did it go? I didn’t want to give up on finding that earring, so I searched the internet and found a couple of local treasure-hunting enthusiasts (yes, you read that right) who would come out and help people look for lost jewelry. I messaged them, and within a day they were in my yard with more metal-detecting equipment than I knew existed. They spent the better half of an afternoon searching my yard for the earring. They even scanned my flock! Holding a bird while someone ran a metal detector over their body must be one of the strangest things I’ve ever done. Unfortunately, even the treasure hunters came back empty-handed. It was not that my chicken ate my earring or even that she dropped it. Evidently she just made it disappear into thin air. My chicken is a wizard. I genuinely thanked them for coming out and treated them to cold Dr. Peppers. Defeated, I wrapped up my lonesome earring and stowed it away in my jewelry box. I had my husband lock up the chickens that night. I was too bitter to face Big Mama, and it took me a couple days to forgive her. But forgive her I did. It was my fault, after all, for wearing jewelry in the coop. I wish I could tell you that I eventually found my earring, but that’s not the case. I knew raising chickens was going to cost money, but I didn’t know it would be that expensive! So please, learn from my mistake and take off your jewelry before entering the coop. And if all else fails, stay calm!